Students at Haven Middle School participate in a walkout on Wednesday. Eight eighth-graders planned the walkout after hearing about the school shooting in Parkland, Florida. Just about an hour before a false report of a person with a gun on the Northwestern campus, a contingent of Haven Middle School students — just a mile away from campus — participated in a walkout to support Parkland, Florida, shooting victims. The optional walkout — held on the one-month anniversary of the shooting at Marjory Stoneman Douglas High School — began at 1:30 p.m.. Students walked around Haven and Kingsley Elementary School with signs that read “This is a school zone not a war zone” and “E-town says enough.” The walkout was organized by eight eighth-graders: Noa Polish, Jake Chiss, Tim Russell, Henry Bush, Nia Powell, Michelle Ogungbemi, Laila Green and Eva Eisman. They said the protest was not political, but meant to show that they want safety in schools. 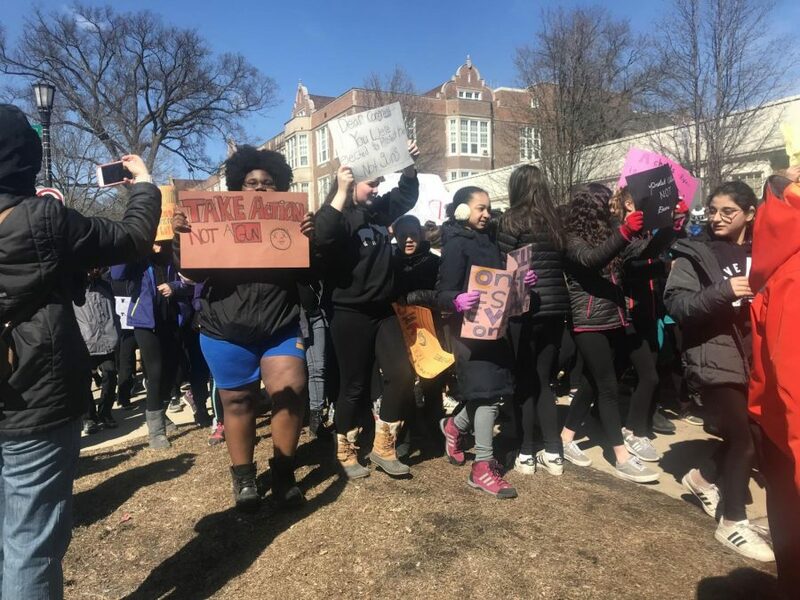 Evanston Township High School and Northwestern also held walkouts earlier in the day. The Haven students said they had originally wanted to hold their event in the morning, but sixth graders had standardized testing. Powell said some students were upset that it was not at the same time as the other schools in the area, though ultimately they decided it was important for the entire school to have the option to participate. “We needed a united front to get our message across to everyone that we are here, we are the future and this is what we want as a school,” Powell said. The students said they organized the walkout after a trip to the Illinois Holocaust Museum and Education Center, where they attended a leadership convention. Eisman said they had to pick an idea to take back to Haven that would improve life in the school in some way. When the shooting in Parkland happened, Eisman said, it “really shook everyone” and they started planning the walkout to bring awareness to gun violence. She said it was the only way they could involve the entire student body, and show they care about the students who have been killed during school shootings. Ogungbemi said seeing the students from Marjory Stoneman Douglas on the news talking about the experience inspired her and the other students to use their own voices to make change. Looking forward, Ogunbemi said she hopes this will result in a movement, not a moment. She added that they want to make an impact so that similar shootings “never” happen again. Eisman said the leaders may now organize efforts to write letters to Congress about gun violence.